If you are looking for a popular roadster, the Mazda MX-5 Miata is for you. It has exterior features that give it its stylish appearance. Two of those exterior features are the soft top and the round tail lights. The soft top on the MX-5 Miata gives it its modern appearance. You can easily put down this top via a one-handed step, so you can enjoy the open air while you are driving. It comes in two colors: Classic Black and Dark Cherry. The other exterior feature that gives the MX-5 Miata a stylistic appearance is its round LED tail lights. These lights fit in with the contemporary design of the vehicle, which looks like it flows in one continuous motion. The tail lights add to that effect. 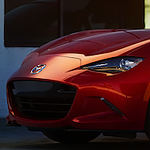 Come on down to Thompson Mazda in Baltimore today to take the Mazda MX-5 Miata for a test drive and for more information.